Learning how to write better from a professor is… like learning how to catch fish from a grizzly bear. The steps require 10s of instruction, and then the fact that at the end of the day they have a pile of fish and you are just wet and tired… you clearly aren’t doing it the (right, i.e. their) way. As a student or postdoc, I’m guessing you spend the vast majority of your time overcoming technical difficulties. You spend months developing intricate methodologies based on creating to produce that one monumental figure, to which your advisor responds, Good, Can you get me a draft by next week? After a week of 20 hour days, you get them a draft that would have earned you an easy A in most classes. 20 minutes after you sent it, your advisor is in your office telling you it has too much detail and the wrong tone…Don’t even bother looking at this draft, just start over. Has this happened to you? I was once in this dizzy cycle for more than a year, and only escaped by getting a new position. Write often, then the fear of writing goes away. Sounds simple doesn’t it? Simple is often hard. The professors I’ve had the privilege of studying under are absolutely better writers than me. Surprisingly, I think I just realized why — practice. Professors don’t spend weeks debugging R code or fighting with Intel vs. PGI compilers on the supercomputer. This is apparent in their constructive suggestion that This would take me 3 minutes in Mathematica (matrix math on a 500 GB data cube, uh no) or Can’t we just do this with a simple model (then why did I just run 40 global circulation model simulations?). They are trying to help, and you are trying to get to the goal; perspectives are simply different. Professors spend the majority of their time looking at ‘near final’ figures and writing. Appreciate that for a moment. All that time you spend doing technical stuff, they are seeing and pondering the big picture and writing about it. I’ve had many student officemates that were masters at R or neural networks or satellite image analysis, but never once shared an office with anyone I would consider to be a great writer. Writing is hard. Writing is also secondary, as we need Nature-class results first, right? After 10 years playing in this world, I think this overarching student and advisor perspective is wrong. 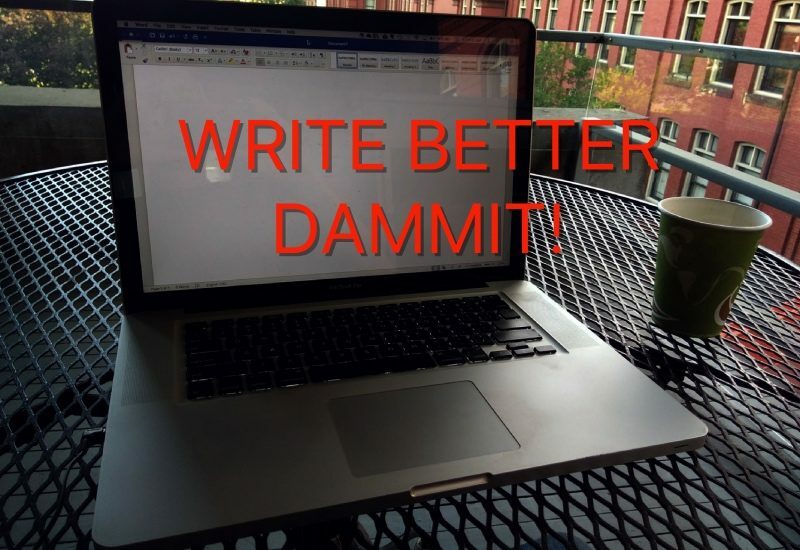 Only after we start writing a lot can the fear of writing go away, and only after that point where we aren’t thinking of 86 other critical things than writing for an hour…only then can we start focus on improving. I’ve also looked to books for help (this book by William Zinsser is great and intriguing), but ‘recipes’ for better writing or constructive criticism are only useful if they are encouraging forward motion away from that crippling blank page. Next steps… I’m not sure. I know that on my 5th day of writing, my text is much sharper and cleaner than the first day, but my technical work gives me something to write about and compels my advisor to keep paying me. Maybe a daily diary of sorts makes sense, maybe even on paper to get me away from this screen? Maybe I should actually try publishing Commentaries or Op-Eds, which I haven’t because I assumed no one would publish them. I’m very cautious about giving advice, and always pose advice to myself before offering it to someone else. This topic seems to be written for me, as I need to write (and publish) more. Using this blog that way seems like an interesting start.